Then: Our third issue included a feature titled “The POZ 50,” which profiled people directly influencing federal AIDS policy. 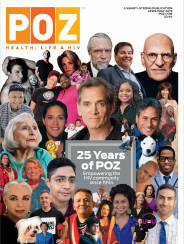 Now: For the past nine years, we’ve devoted our year-end issue to The POZ 100, each time spotlighting members of a specific community, including Southerners, long-term survivors, youth and women—as nominated by you, the POZ reader. Then: Basketball icon Earvin “Magic” Johnson shocked the world in 1991 when he announced he had HIV. Three years later, when POZ debuted, he remained the most famous person in the world living with the virus. It could be argued he still is. Now: A handful of other sports icons, reality TV stars, artists and TV personalities have publicly disclosed their HIV status, but in November 2015, one household name came close to making Magic-sized headlines: actor Charlie Sheen. Then: Several pages in each issue were devoted to Letters to the Editor, which had to be snail mailed or emailed and offered a window into discussions among the community. 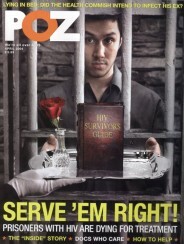 A section of the magazine called POZ Partner included hotlines and listings. Now: Feedback arrives instantly via comments, shares and likes on social media. Our website houses the directories (no longer in our print version), plus POZ Personals, POZ Forums, blogs, daily news and all content from the past 25 years. Then: As our first issue went to print, Philadelphia was up for several Oscars (Tom Hanks won Best Actor). A POZ article pondered which AIDS film could be the next big hit: Boys on the Side, Jeffrey, The Night Larry Kramer Kissed Me, Angels in America (which became an HBO miniseries in 2003) or The Normal Heart (eventually made as an HBO movie in 2014). Now: This year, two actors happened to be nominated for Academy Awards for playing real-life HIV-positive men who died in the 1990s. Richard E. Grant received a Best Supporting Actor nod for the role of Jack Hock in Can You Ever Forgive Me? And Rami Malek, who played Freddie Mercury in Bohemian Rhapsody, took home the Best Actor trophy. Rock on! Then: The POZ buzzword of 1994 was condomania. The prophylactics were promoted everywhere, including on New York City subways thanks to a progressive GMHC campaign, which the Catholic League was quick to denounce as promoting promiscuity. Now: PrEP and PEP, or pre- and post-exposure prophylaxis, are finally getting the attention they deserve via social media campaigns, TV commercials and, yes, subway ads. Then: Effective treatment didn’t exist in 1994. Activists urgently prodded for research, but they were suffering from burnout and creeping cynicism. “ACT UP is dead,” pronounced Larry Kramer. Now: We have several treatment options, many in one-pill-a-day formulations. High costs and access remain challenges. But the good news is we know treatment also acts as prevention, a fact referred to as Undetectable = Untransmittable (U=U). Then: Our debut issue profiled Bob Hattoy, a longtime friend of the Clintons who was HIV positive and worked in their White House. In terms of politics, 1994 was a hopeful time for those with HIV, considering they had been shut out by the two previous presidents, Ronald Reagan and George H. W. Bush. Now: President Trump announced a plan to end the U.S. HIV epidemic by 2030. Though it’s feasible, skeptics point out that he spent the prior two years attacking health care and effectively firing the Presidential Advisory Council on HIV/AIDS. For a more detailed look at these topics, visit POZ.com/25.